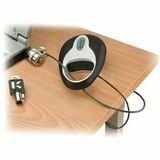 Kensington Microsaver Retractable Portable Notebook Lock & Cable/Security Device for Mac or PC - 64149 by Kensington at Andy Pemberton. MPN: 64149. Hurry! Limited time offer. Offer valid only while supplies last. Kensington Edge: Retractable, portable 4' security cable lock combines notebook security with an easy-to-use design.